The Issues relating to the LGBT became widely debatable all over Indian following the de-reading of the Article 377 by the Delhi High Court. As a part of the ongoing debate, the IIAS at Shimla held a two-day national seminar on the LGBT subject in April 2012. The Seminar was first of its kind in India and therefore it received an exciting response from the native scholars, students teachers, filmmakers, activists, and the legal luminaries. The all made original presentations on the various projections of the gay subcultures in the Bollywood cinema, TV serials, and fictional literatures. The present Anthology is a collection of the sixteen papers selected from the seminar, dealing with different issues concerning the LGBTs as projected in the Indian creative endeavors. The papers offer a scintillating critique of the burning problems bearing upon the gay community at present in India. The analysis not only aid the genuine perception of the LGBTs' existing predicament but also point to several remedial measures for the preservation of their liberty, dignity and human rights. As a unique scholarly work, the Anthology will redraw boundaries of the gay space in India and thereby pave way toward a proper place for the LGBTs in the Indian society. It would as well facilitate a fit understanding of the LGBTs' live and literatures as an affirmation of their genuine human aspirations. The Issues relating to the LGBT became widely debatable all over Indian following the de-reading of the Article 377 by the Delhi High Court. As a part of the ongoing debate, the IIAS at Shimla held a two-day national seminar on the LGBT subject in April 2012. The Seminar was first of its kind in India and therefore it received an exciting response from the native scholars, students teachers, filmmakers, activists, and the legal luminaries. 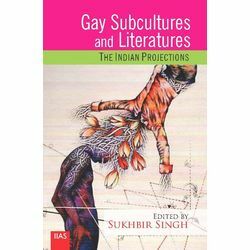 The all made original presentations on the various projections of the gay subcultures in the Bollywood cinema, TV serials, and fictional literatures. The present Anthology is a collection of the sixteen papers selected from the seminar, dealing with different issues concerning the LGBTs as projected in the Indian creative endeavors. The papers offer a scintillating critique of the burning problems bearing upon the gay community at present in India. The analysis not only aid the genuine perception of the LGBTs' existing predicament but also point to several remedial measures for the preservation of their liberty, dignity and human rights. As a unique scholarly work, the Anthology will redraw boundaries of the gay space in India and thereby pave way toward a proper place for the LGBTs in the Indian society. It would as well facilitate a fit understanding of the LGBTs' live and literatures as an affirmation of their genuine human aspirations.